Celebrity photographer Rankin has said he hopes to return to the Congolese refugee camp whose inhabitants feature in his new exhibition. 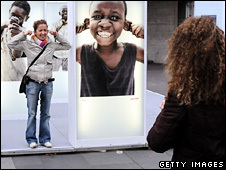 Cheka Kidogo - "smile a little" in Swahili - has opened outside London's National Theatre. 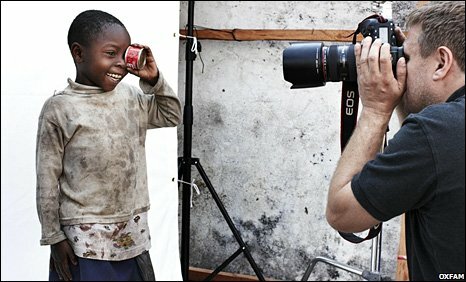 Rankin took the photographs to raise awareness of Oxfam's work in the Democratic Republic of Congo. "I'd love to go back," he said, adding he was keeping in touch with the people of the Mugunga camp. "It gave me a sense of hope for the world - it energised me, I felt angry and helpless, but it got me in touch with something beyond shallow commercial culture," said the photographer, who is best known for his portraits of the likes of Kate Moss. The people in the camp have been been forced to leave their homes because of the violence which has engulfed the west African state. 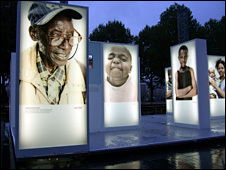 Cheka Kidogo sees illuminated images of Muganga's residents placed on stands outside the theatre, on London's South Bank - one of the capital's busiest tourist and entertainment hubs. Rankin applied his usual celebrity portraiture style, so the men, women and children of the camp are seen laughing or pulling faces as well as striking more serious poses. "I think people have become very immune to war and conflict photography, and I thought that if I took my style of photo, which is quite emotive, and very much about the people being positive, and went to somewhere and took photos of the people there, I thought that would be a different take on how we approach this," he said. "I didn't know much about Congo, like everybody else. I heard about the statistics and was so shocked - it gets so little media attention, so I thought if there was one place I could do some good, it would be there. I wanted to put faces to the statistics." Rankin said he was delighted by the response to the exhibition, which runs until 21 December. "I liked that people were taking photos [of each other] next to my photos. I thought that was almost the perfect reaction - I really wanted the photos to be images that people felt good about. I didn't want them to feel bad about them," he said. "I want people to get a good, positive energy from them, so they become interested in the people and why they are there. "One of the things I wanted to do was give the people dignity. It really feels like we're really giving them dignity and a reason to have their photographs taken. "As a photographer who usually works in advertising and fashion, to actually have something that has a meaning is a really amazing feeling."